Chris Ogbonnaya (born May 20, 1986) is an American football running back for the Houston Texans. Chris played football at Strake Jesuit College Preparatory in Houston, Texas, where he was a three-year letterman who helped his team post a 27-5 record during his varsity career. As the teams leading rusher, he helped his squad to a 9-2 mark as a senior making 20 catches for 500 yards and four touchdowns with 270 yards rushing and two TDs that year. He caught 22 passes for 530 yards and eight TDs with 500 yards rushing and eight more TDs as a junior and also returned a kickoff for a TD that year while leading his team to an 8-3 record as a junior. 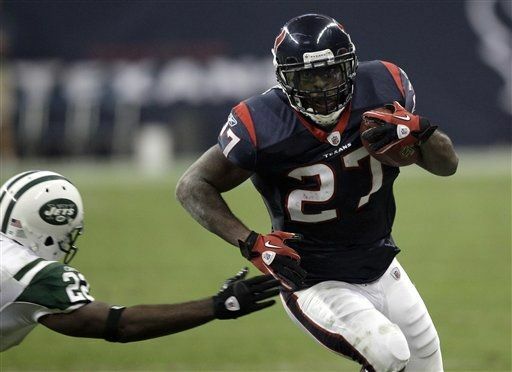 He was the Greater Houston Offensive Player of the Year honors that season and on defense he had 57 tackles, three TFL and eight PBUs as a cornerback in 2002. He had 30 receptions for 600 yards and 10 TDs and added five interceptions from his cornerback spot for a 10-0 squad his sophomore year. He lettered in basketball for two years also lettered in track & field for three years. Ogbonnaya attended the University of Texas where he was a three-year letterman who appeared in 47 games at running back and on special teams. Career totals were 140 carries for 597 yards (4.3 ypc) and eight TDs and made 75 receptions for 792 yards and three TDs. He appeared in all 13 games, starting seven, in 2008 and earned honorable mention All-Big 12. He carried the ball 74 times for 373 yards (5.0 ypc) and four TDs and recorded 46 receptions for 540 yards and three TDs, including a 65-yard TD reception at Colorado. He appeared in all 13 games at tailback and on special teams in 2007 and had 26 carries for 66 yards and two TDs and 21 receptions for 204 yards. He also returned four kickoffs for 74 yards and had one special teams tackle. He played in all 13 games at fullback and on special teams in 2006 and rushed 18 times for 82 yards and a TD and caught seven passes for 45 yards. He saw action in eight games during Texas' 2005 National Championship season and rushed 22 times for 76 yards and a TD. He moved to tailback after spending his redshirt season as a wide receiver. Ogbonnaya was a four-time First-team Academic All-Big 12 honoree.